Neath & Cardiff coaches were affectionately known as ‘Brown Bombers’ and they certainly made short work of demolishing the miles along the M4. 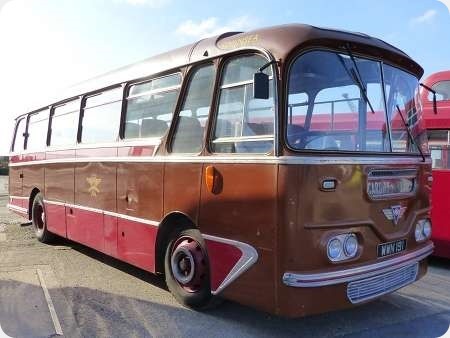 This AEC Reliance (2MU3RA083) carries a handsome Harrington C41F body (2309) and was new to Neath & Cardiff in 1960. I am not sure if this striking (for me) livery would eventually give way to the uninspiring NBC livery. After eventual withdrawal by the NBC she still had a varied career until being brought back to the Swansea Bus Museum, on whose 2016 Running Day in original Neath & Cardiff livery we see her. N&C were taken over by South Wales before the corporate identity was introduced. Used to love seeing these at Cardiff Bus Station (RIP) in the sixties. But surely they weren’t doing many miles on the M4 when first delivered? In the days when N&C were operational, the M4 motorway terminated at Tredegar Park at the western edge of Newport. The only motorway west of there was the elevated section of the M48 at Port Talbot. I don’t recall N&C operating along this elevated section.